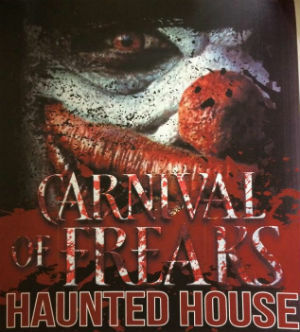 Carnival of Freaks is a Halloween Haunted House and Trail that you don’t want to miss, located in Licking, MO. 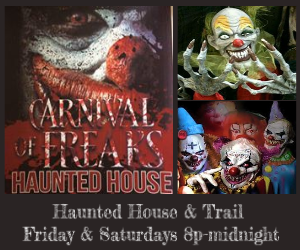 The operating hours are Friday and Saturday nights from 9/21 through 11/3, 8pm - midnight. BE READY TO BE SCARED! We drove from O'Fallon IL to check this place out. Well worth it! We loved it. 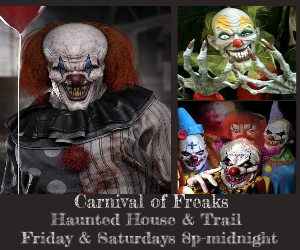 Super scary and so much fun! Awesome set up, props and actors. The owners and their family were so nice too. Love this place! Best haunted house that I've been to yet! Drove almost two hours to get here, and it was absolutely worth it! The price range was more than reasonable, and I wish I would have gone through twice. (I think I'd have seen more if I wouldn't have been so scared the first time around, lol.) Definitely going to make the trip next year, and I highly encourage anyone else to make the trip. You won't be disappointed. Oh man so worth the money. By boyfriend and I had so much fun. I like how they had a fire pit outside to sit by to catch your breath after. Went there last night, we all had a blast!! This is our third year in a row going, and we will make sure to keep going as long as you all keep opening!! This place was so awesome! Definitely worth the money. The effects and scares were different then what I’d seen before. And it’s long so you aren’t waiting in line for a 5 minute walkthrough.